By Katherine Seymour, D&SW Branch Trustee. On the first Friday afternoon in June each year the traffic is brought to a halt on the road between Blandford Forum and Salisbury and, for a brief moment, silence descends on a small corner of an English field above the village of Pimperne so that an Act of Remembrance can take place. This two-minute silence is part of the annual service held at Collingwood Corner, the site of an obelisk-shaped memorial in a tiny garden near to Blandford Camp. The polished marble memorial commemorates the officers and men of the Collingwood Battalion, Royal Naval Division, who gave their lives at Gallipoli on 4 June, 1915. The 2011 service was taken by the chaplain of HMS Collingwood, the Royal Navy's largest training establishment, which also provided the guard of honour. After the wreath-laying a lone piper played a lament which carried across the fields where the Collingwood Battalion had trained before setting off for the First World War campaign in which so many of them were lost. In 2010, Stuart Adam, "a grandson of the RND", whose family has had a long association with the memorial and with organising the annual service of Remembrance, invited those with an interest in honouring the memory of the Collingwood Battalion and the Royal Naval Division to become founding members of the Friends of the Collingwood Memorial. 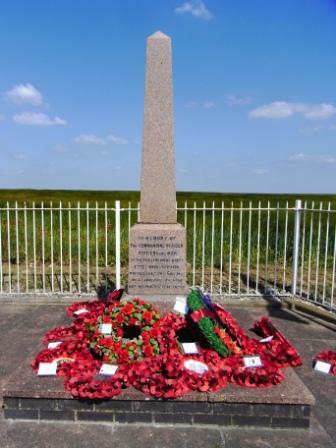 Subscriptions from Friends will be used to fund the maintenance of the memorial and the costs of the annual service so that both have a secure future. On 3 June 2011, in hot sunshine, the hymns "Jerusalem", "I Vow to Thee My Country" and the naval hymn "Eternal Father" were played by the Light Cavalry Band. Through this Act of Remembrance not only those of the Collingwood Battalion but also men who lost their lives during World War One whilst serving with the Anson, Benbow, Drake, Hawke, Howe, Hood, Nelson and Royal Marine Battalions were remembered. Several Dorset and South Wiltshire WFA Branch members have become Friends of the Collingwood Memorial, each with their personal reason for wanting to preserve the memory of those who were lost. "It all began in 1940 at Newcastle-upon-Tyne. Between that city and London my Mother and I travelled to and fro fairly frequently, which meant changing one air-raid shelter for another. In each garden there was the half-buried corrugated arrangement into which one would repair upon hearing the siren. It must have been dreadful for adults, but for a child it was an extremely exciting time. The sight of half the street missing upon emerging from the damp, earthen-scented shelter in South London, etched itself upon an eager and alert young mind. Oh, would that it had been so eager and alert later in life! The newspaper in the North East bore the headline "Durham man wins the VC." It was explained to me by an uncle, wearing an A.R.P. steel helmet, what a VC was. 2nd. Lieutenant Richard Annand of the Durham Light Infantry had won the Victoria Cross, that greatest of all awards for valour, by single handedly driving off the enemy by hurling hand grenades at them as they prepared to attack. Although wounded he again attacked the enemy with grenades the same evening. Added to this heroism was an extremely brave act of recovering his wounded batman, by means of a wheelbarrow, when he had been discovered missing. Over the years I checked with Whittaker's Almanack, in the surviving VC's section, that the now Captain Annand was still alive. A local hero indeed. In later years when the number of survivors barely filled half a page Capt. Annand's name was still there. Having moved to Dorset from London in 1990 I attended the funeral of Admiral Godfrey Place VC in Sherborne Abbey. Surviving VCs and GCs attended. Following the ceremony I stood on the grass outside that superb edifice watching the distinguished visitors emerge. One elderly gentleman, wearing his Victoria Cross, came in my direction and said that he was waiting for his wife. He asked if I had come far to attend, and I replied that I had not. I asked where he was from and he replied, "Durham City," I said "You are Captain Annand!" He then looked surprised when I mentioned more local connections with Durham. When I told him that I was born at Chester-le-Street, County Durham we got into deeper discussion. He was, of course, a Durham man himself. So, there, outside Sherborne Abbey, I met my boyhood hero. He explained how he came down every year in June to lay a wreath on behalf of his late father who, as the adjutant of the Collingwood Battalion, had been killed at Gallipoli on the 4th June 1915. I learned that the remnants of the Battalion had been attached to the Hood Battalion in which my uncle, by marriage, Harry Bone MM, had served and survived the conflict. I attended the next ceremony at Collingwood and was told of a wreath being laid on behalf of Able Seaman Askew, a 19 year-old lad born in Chester-le-Street, my own place of birth. Each year it had been funded by his niece living in County Durham and was laid by whosoever was available on the day. 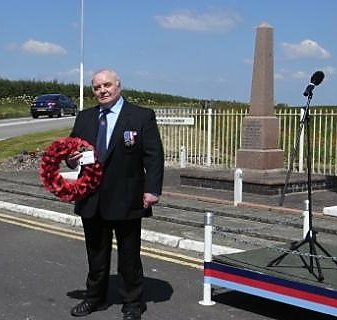 That dedicated man of arrangement and manipulation, Bless him!, Roy Adam MBE learned that I was a Durham lad and ever since I have had the honour and privilege of laying that wreath. I always remember, too, my Uncle Harry, of the Hood Battalion to which were assigned the survivors of Collingwood. To make the experience even more interesting, the wreath to be laid immediately before "mine" was that being carried by Capt. Richard Annand VC in memory of his father. Each year we stood and nattered about Durham until the ceremony began. Over the years that lovely man and his charming wife, Shirley, proved such sweet and interesting company that it was indeed a pleasure and a privilege to be there. Alas, the splendid pair is with us no more and now two nephews attend the ceremony and lay the wreath. These friendly and amusing relatives of the Annands carry on the fine tradition. I have made some local enquiries in County Durham but have not been able to contact any relatives of the young Able Seaman Askew who was born around 1896 in Chester-le-Street. However, he is not forgotten."